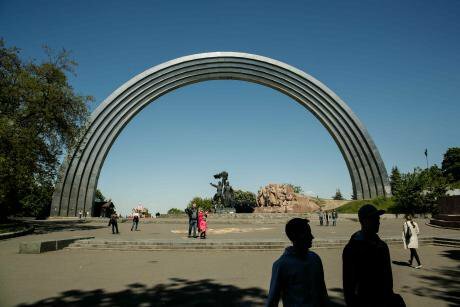 Kyiv's Friendship of Arch, temporarily renamed the Arch of Diversity in honour of the 2017 EuroVision Song Contest. (c) NurPhoto/SIPA USA/PA Images. All rights reserved.Since war broke out in 2014, Ukraine has experienced a difficult period both for its citizens and liberal values, which are the bedrock of any democratic state. The war has affected almost everybody in the country, and the conflict has become a justification for illiberal initiatives undertaken by Ukraine’s state apparatus. For Ukrainian society, the choice in favour of liberal freedoms is becoming more and more difficult. At first glance, restricting them seems to be necessary. In December last year, Fareed Zakaria wrote in the Washington Post about the coming of illiberal democracy to America. He cites the examples of Hungary, Iraq, Philippines, Russia and Turkey as states where some form of democracy is maintained, but where a range of liberal freedoms is disappearing. It’s not enough to strengthen provisions for the rule of law, the rights of minorities, freedom of speech in national legislation — these norms should be put into practice. As Zakaria writes, today, America’s culture of liberal democracy is weakening, and this process should concern both Republicans and Democrats. These worrying trends are visible across the Atlantic ocean, from Ukraine. Indeed, Ukrainian citizens support the women who come out to protest, Muslims who face discrimination and suspicion, and the newspapers whose correspondents have been refused entry to presidential press conferences. But this support seems to reflect an opportunity to observe the crisis of liberal democracy elsewhere. And this begs the question: are liberal values merely an object to be observed at a distance for Ukraine? Is this just an opportunity to sympathise with the crisis of democracy in Europe and America? It’d be wrong to say that Ukrainian citizens cannot see illiberal tendencies in their country. But there is one factor that restrains our reaction to them: the external threat. In discussions of liberal democracy — from freedom of speech to the right to peaceful assembly — the importance of observing human rights is not placed first. 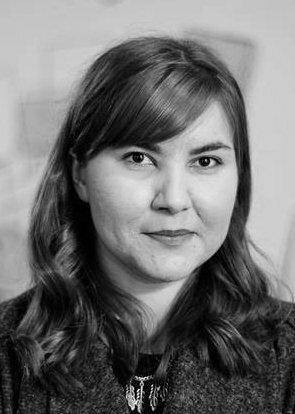 Are liberal values merely an object to be observed at a distance for Ukraine? Is this just an opportunity to sympathise with the crisis of democracy in Europe and America? There’s an expression in Ukrainian “ne na chasi”, which means literally “not the time”. The expression doesn’t imply that something isn’t necessary, but that it should be postponed for a certain period. In Ukraine’s case, this time will come after the war ends. When the issue of the country’s security is solved, that’s when different groups in society will be able to talk about various issues. These non-governmental institutions and informal groups criticise and correct the agenda of Ukraine’s state institutions, to ensure they follow the interests of the entire society. But as Cas Mudde writes in “No, we are NOT all Charlie (and that’s a problem)”, this criticism can also be selective and subject to self-censorship. Writing a few days after the attack on the Charlie Hebdo office in Paris in 2015, Mudde argued that it’s easier to speak in the name of an entire society than to speak as an individual. Back then, the media campaigns that called for solidarity with Charlie Hebdo in the name of liberal values attracted people who, prior to the attack, would have refrained from criticising or supporting the magazine’s staff. In February 2017, a situation similar to the Charlie Hebdo attack took place at Kyiv’s Center for Visual Culture. 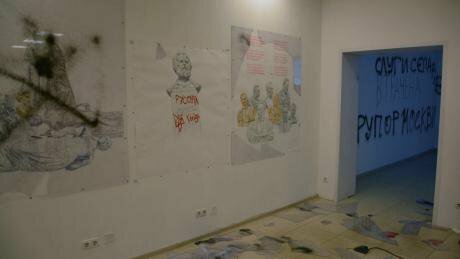 Members of a far-right nationalist organisation attacked an exhibition by anarchist artist David Chichkan. But here, Ukrainian society made no large-scale demonstration of solidarity in support of freedom of expression. David Chichkan's exhibition "Lost Opportunity" after it was attacked in February 2017. Source: Political Critique. Far-right activists smashed windows, ripped up Chichkan’s pictures and sprayed slogans accusing him of separatism and playing up to Moscow. In this exhibition (“Lost opportunity”), Chichkan demonstrated his attitude to the chance for reforming the Ukrainian state that he believes Ukrainian citizens had lost after EuroMaidan. The artist believes that opportunities for change have been substituted with a nationalist programme and policy carried out by the Ukrainian Institute of National Memory, which is based on the extreme right-wing ideology of Ukrainian nationalists during the 1930s and 1940s. Ukrainian society’s consensus of justification towards people who have turned patriotism into vandalism is becoming more and more tangible. Indeed, when a country is at war, and the border with the aggressor state remains open, right-wing politicians offer a clear understanding of the situation. This picture is simplified, and is based exclusively on the national idea and ethnocentrism. And it’s possible that right-wing vision of the situation at hand are incompatible with the Constitution, and stretch our understanding of freedom of speech. But they give people an opportunity to solve the problems facing the country and society via very simple methods. Since EuroMaidan, historians and other researchers have been discussing the extent to which the far-right were involved in the 2014 protest, and whether they were the driving force. There is no universal formula that would show how nationalist organisations influence politics. Indeed, electoral support at presidential or parliamentary campaigns doesn’t always reflect this influence. When a country is basically at war, this situation raises patriotic feelings and makes certain slogans (otherwise the exclusive domain of the rightwing) more visible. This is how society turns to the right. I’m talking about those ideas that are to the right of the centre, and which aren’t compatible with liberal values, but which aren’t a direct expression of far-right political views. In Ukraine, political parties, apart from the obviously nationalist ones, don’t have much in the way of ideology. They rely on their leaders’ personal charisma. This is why it’s easy for Ukrainian politicians to pick up slogans that appeal to their electorate. 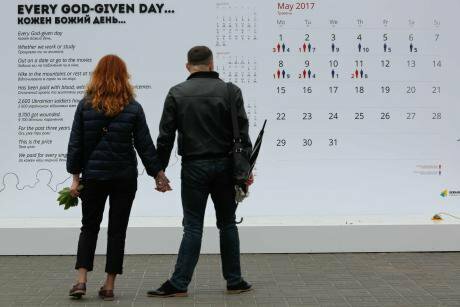 According to recent surveys carried out by Kiev International Institute of Sociology, Ukrainians name the war, living standards, economic situation and security as the issues that are most important to them. And if the Ukrainian electorate wants to build a wall with Russia, then the refusal to use Russian social networks could be the prototype — it doesn’t necessarily have to be made out of bricks. A public exhibition detailing casualties and deaths at the frontline of the Donbas conflict. (c) NurPhoto/SIPA USA/PA Images. All rights reserved.On 16 May, President Petro Poroshenko signed a decree on the decision by Ukraine’s National Security and Defence Council on “applying special personalised economic and other limiting measures”. Among others, the popular Russian social media websites VKontake and Odnoklassniki fell under these sanctions. And given that these websites were named “economically unsafe” only in the third year of the Russian-Ukrainian war, it raises questions about why this step wasn’t taken earlier. The ban on social networks (which are used mostly for mobilisation or entertainment) became more prominent than the educational campaigns about why signing over personal information to Russian social networks might be risky for users. There were no prominent protests against this decree. The debate about whether freedom of speech can be limited during wartime has divided Ukrainian society between those who are ready to forego human rights under conditions of war, and those who aren’t. Indeed, Ukrainian journalists, public figures and human rights defenders are among those who supported the ban against Russian social media. In Ukraine, the limits of the permissible, which can be violated by the state, are becoming less and less clear. And it is no less hard for a society traumatised by war to resist simplifications and ignore the destruction of something valuable before its very eyes.